Taco trucks are pretty hard to find during the day but Highland Park has two pretty darn good ones that park within 100 feet of each that operate day and night. 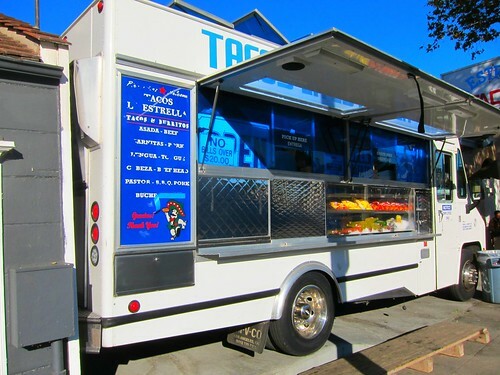 La Estrella and El pique may be the closest LA has to a taco truck rivalry and judging by the equal activity at both trucks locals are pretty split on which truck slings the tastiest street tacos. La Estrella’s permanent fixture at the corner of York Blvd and Ave 54 is evident by the large La Estrella sign. There are also a couple of tables to sit and eat if that’s your thing. Given my choice I’d rather just eat on the hood of my car. The tacos come topped with the onions, cilantro, and salsa roja. The al pastor has the texture of carnitas and the achiote seasoning gives the pork a nice peppery flavor. The flavor is there but I’m not sure how this taco can be considered al pastor. 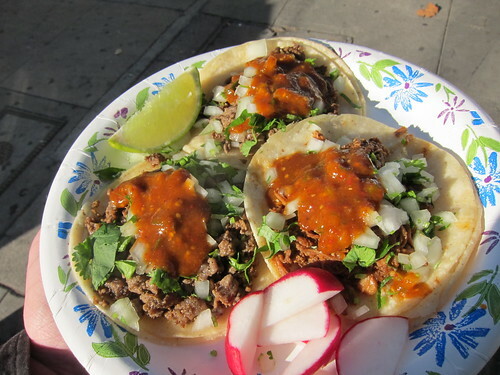 That doesn’t stop me from ordering it whenever I’m at a La Estrella taco truck; when combined with the salsa roja it just makes for a pretty damn delicious taco. For a more traditional taco stick with the asada; the greasy finely chopped beef never disappoints. On this day the weakness was the salsa roja, which was milder than usual. The salsa at La Estrella usually has a kick to it; so lets hope it was just a bad batch and not a change in salsa heat policy. York Blvd during the day has a different vibe. At night you could spend hours sampling tacos from taco trucks to pop-up taco tables indulging in everything from al pastor that is carved to order to fresh plates of birria. Head east to Figueroa and the night may never end. But I’ve always loved York Blvd during the day and it probably has a lot to do with El Pique and La Estrella. It’s good to know that good tacos can be had from LA trucks before the sun goes down. 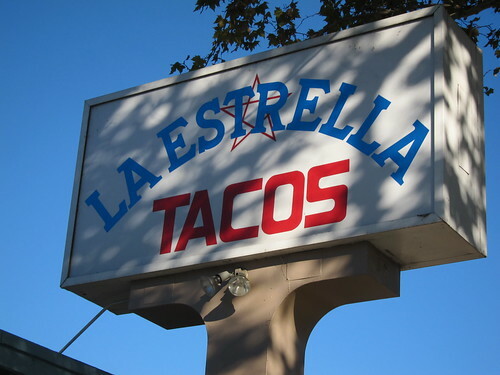 is this the same la estrella that's on fair oaks in pasadena? I think so. 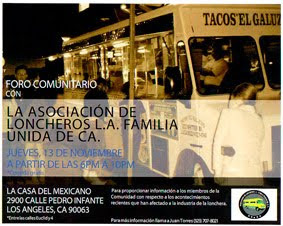 But the website for the Pasadena locations doesn't mention the locations of their taco trucks, just that they started in a lunch truck.